Hungering for some out-of-this-world pinto beans and Spanish rice? In the mood for mouth-watering carne asada? Lucky for you, the Daily Meal put out its list of “America’s 20 Best Burritos” on Wednesday. Five Bay Area taquerias are not only on the list but in the top six. And the No. 1 and 2 spots are right in San Francisco. "Obviously, the top end of our list is California heavy," the Daily Meal wrote on the state with the large influx of Mexican immigrants and influences. The secret judges chose burritos based on having fresh ingredients, a good selection of meats and add-ons, being able to customize your order, and being renowned by critics and customers alike. 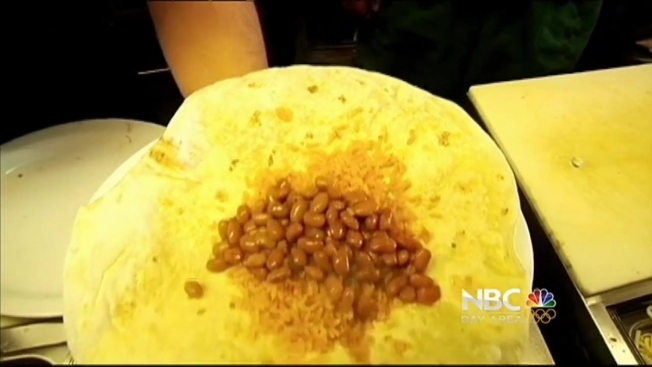 In fact, the best burrito in the country, according to the epicureans at the Daily Meal, is the carne asada burrito at Papalote Mexican Grill in San Francisco, owned by NBC Bay Area on-air reporter, Jodi Hernandez, her husband, Victor Escobedo and his brother, Miguel Escobedo. Papalote means kite in Spanish, and the restaurant is decorated with beautiful kites. And the company also makes its own salsa. The family’s secrets? There are two. The meat is cooked to order, and they have to be cooked consistently. “We’ve been cooking the burrito the same way for 15 years,” Escobedo said. He and his wife own two shops, one at the corner of 24th and Valencia streets in the Mission District, and the other at Fulton Street and Masonic Avenue. The shop in the Mission is well known because of its bright blue tiles. The restaurant's "Triple Threat Burrito" won the "Burrito Throwdown" with Food Network's Bobby Flay iin 2010. The other Bay Area best burritos listed are: La Taqueria in San Francisco, Gordo Taqueria in Albany, Taqueria Los Charros in Mountain View and Tacqueria Cancun in San Francisco. For the entire Top 20 list, click here.